The relaxing aesthetic of an aquarium with LED lighting cannot be denied, which explains why so many people go for it. With the right LED lighting, your aquarium will evolve a whole new personality, one that will brighten your room in a warm and lively fashion. For that to happen, you should first make sure that you’re using the right LED lights. These lights can differ quite a lot on account of their construction, brightness, and versatility. This is why you want to take the time and learn as much as you possibly can about what makes a good aquarium LED light before committing to a purchase. 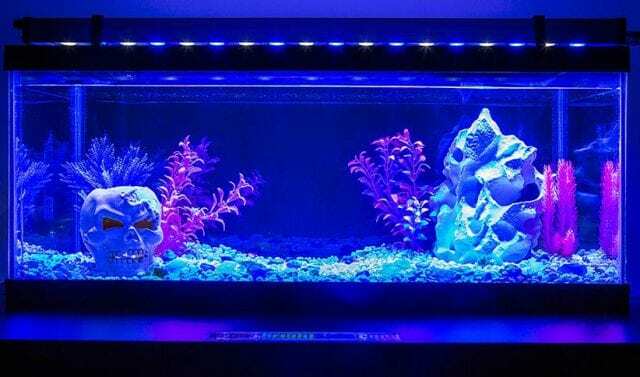 To help you in that regard, we put together a list of the ten best aquarium LED lighting the market has to offer right now. Equipped with high-quality white, blue, and red LED lights, the Aqueon Optibright Plus LED Lighting System can be easily operated with individual controls for each mode. Crafted with premium quality, heavy-duty materials, it comes with an RF remote control with a 24-hour timer. Unlike others, this LED fixture also comes with 8 color options that can be easily customized according to your personal preference. The automatic timer changes every 30 minutes from sunrise to sunset mode during every cycle and is ideal for freshwater, marine fish aquariums and aquariums that contain low-light to medium light level plants. 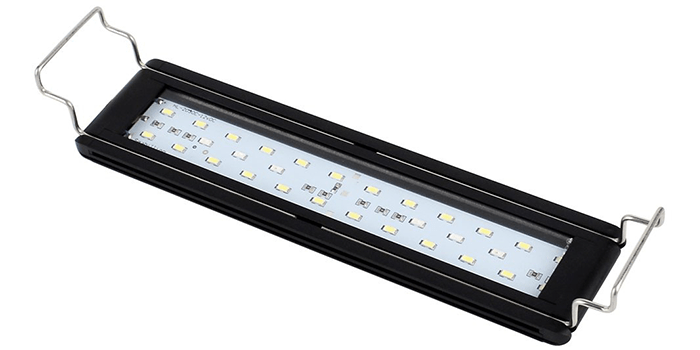 Providing you with high-powered, efficient, premium grade lighting, the BeamsWork LED 1W HI Lumen Aquarium Light is the best replacement for your standard fluorescent lights. Crafted with 1W LED lights, it provides optimum illumination throughout the aquarium. Designed and made from high-quality materials, it comes with special brackets that can be easily extended to fit your aquarium perfectly. Along with this, it also comes equipped with a timer for controlling the various lighting effects that include a day and a night mode. Durable, long-lasting and affordable, this aquarium light is ideal for coral reefs, freshwater setups and more. The NICREW LED Aquarium Light is a premium grade 13-watt, high powered LED lighting device that is uniquely crafted for desktop and nano aquariums that are up to 10 gallons in size. Featuring adjustable legs that are easy to mount, it can be fitted into aquarium tanks from 12 to 18 inches in size. Equipped with a special moonlight mode, it provides a cool, starry nighttime effect that is soothing and beautiful to look at. 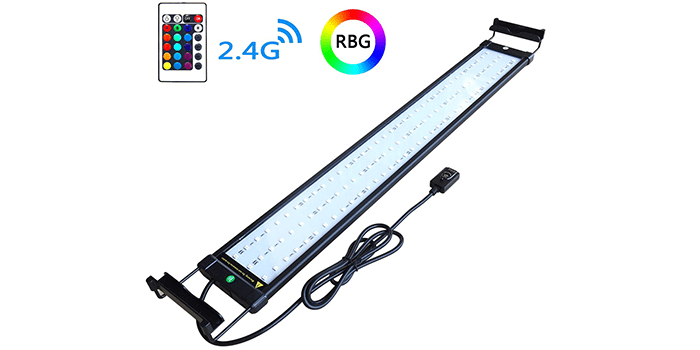 Thanks to its White and tri-colored RGB LED lights, it offers exceptional lighting for aquariums with plants. Known for its high performance, the NICREW ClassicLED Plus LED Aquarium Light features a stylish, classy appearance with a heavy-duty, low-profile aluminum construction. Thanks to its full spectrum LED lights, it boost the growth and development of healthy fish and marine plants. Compared to the ClassicLED Aquarium Light from NICREW, this one is 25% brighter and more efficient. Featuring adjustable legs, this LED lighting fixture can be fitted into rimless as well as framed aquariums and is great for freshwater and saltwater fish. Featuring 6,500K white and 460nm blue LEDs, the Marineland Hidden LED Strip Light for Aquariums provides optimum illumination in any size tank. Crafted with premium grade materials, it features multiple mounting systems that include an in-frame option which provides visibility of the light without the fixture or any attached cords or cables. 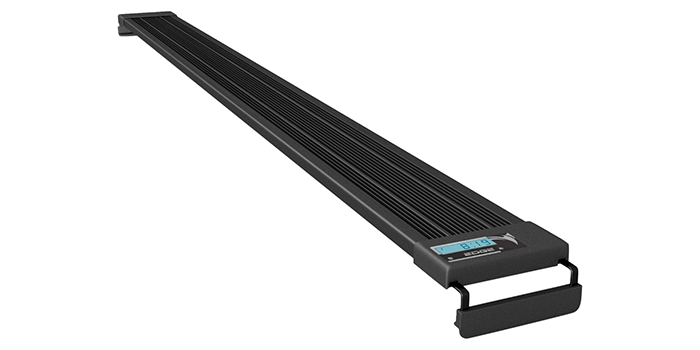 Measuring 21 inches in length, it features a dial that can be rotated and adjusted to position the LEDs to shine in any direction you prefer. Designed to fit aquariums that are between 47 inches to 50.25 inches wide, the Aquatic Life LED Aquarium Light Fixture features 6 vibrant LED lights that are ideal for all kinds of aquariums. Equipped with a 3-channel timer, it controls the white LED, the mixed colors and the blue LED separately. Thanks to its special programmable feature, the LED lights can be set to turn off and on over time with various special effects that include sunrise, sunset, and moonlights and shimmer effects. Made from heavy-duty materials, this durable light fixture is easy to operate and budget-friendly. Uniquely designed for freshwater and saltwater, the COODIA Aquarium Hood Lighting is a high-quality lighting fixture that comes with a wide range of colors and lighting modes. 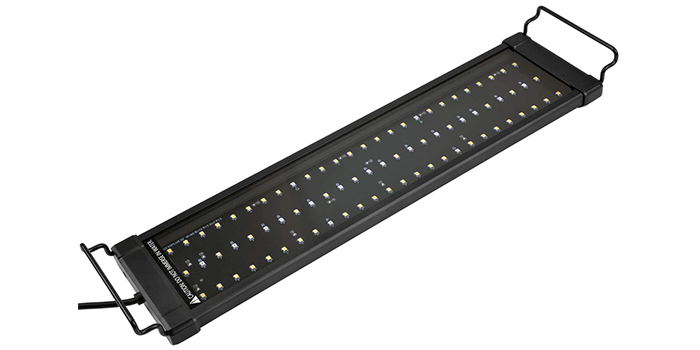 Beneficial for plant growth, this LED fixture features a special power-supply design that helps save energy and can run up to 10,000 hours. Equipped with an extendable bracket, it allows you to adjust the length of the fixture so that it fits into your aquarium perfectly. Featuring the latest 2.4G remote mechanism, this device can be operated from anywhere, even through a wall. Easy to operate, ultra-bright and durable, this LED aquarium light is ideal for freshwater and seawater. This high-quality Aquarium LED fixture from BeamsWork EA features a Freshwater Full Spectrum (FSPEC) that offers optimum. High quality, efficient lighting throughout your aquarium. Featuring a sleek, contemporary design and construction, this LED fixture is stylish and can accentuate any aquarium with ease. Equipped with durable LED lights, it does not require replacing and comes with a dual-mode setting that includes a day mode and a moonlight, night mode. It also comes with an extendable bracket that can be easily adjusted so that it fits into your aquarium. Built with a sleek frame and sturdy construction, the Finnex FugeRay Planted+ Aquarium LED Light comes equipped with 660nm intensive photosynthesis Red LED lights that boost freshwater growth and photosynthesis. 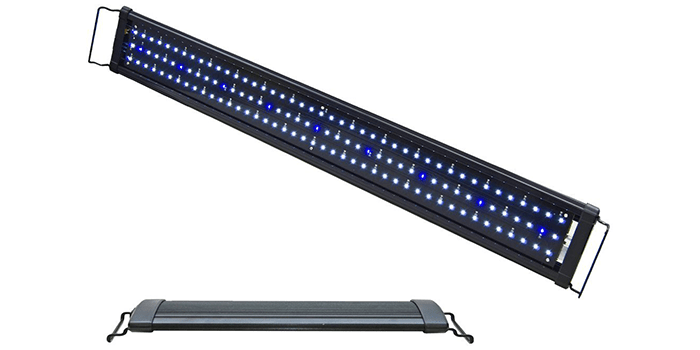 Offering a warm, mild tone throughout the aquarium, this LED fixture also comes with a blue moonlight feature. Equipped with high-powered LED bulbs that can go up to 40,000 hours, this premium quality LED light can illuminate large sized aquariums with ease. Unlike others of its kind, this one comes with an aluminum circuit board that allows optimum syncing of heating and cooling. 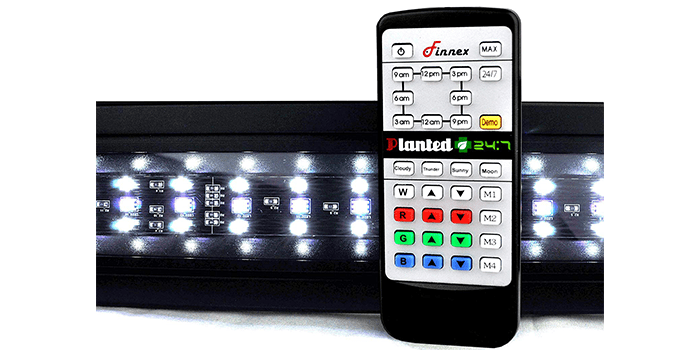 The Finnex Planted+ 24/7 Fully Automated Aquarium LED is a premium quality lighting device crafted with 4 customizable color channels. Including a vibrant fire red sunrise to a starry blue night, this device comes with a dimmable function along with special elements like thunder, cloudy, sunny, and moonlight. Made from high-quality materials, it measures approximately 48 inches long and is hands-free. Thanks to its 7k blend of multi-colors, it also helps in the growth of plants, a much-needed feature for modern aquariums yet one that you rarely find in a LED lighting set.